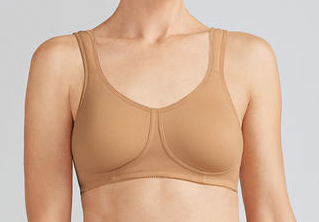 A mastectomy bra is made with a specially designated pocket in each cup. The breast form is slipped inside the pocket, where it is held firmly in place against the body for a natural recreation of symmetry. A well designed bra will keep breast forms in place and looking natural. We have a wide variety of styles, from elegant to sports bras. Some insurance companies allow you the option to purchase items that are Deluxe. These items are more expensive than the standard products and require an upfront out of pocket payment. All bra purchases are final once worn. You may exchange unworn bras within 7 days.